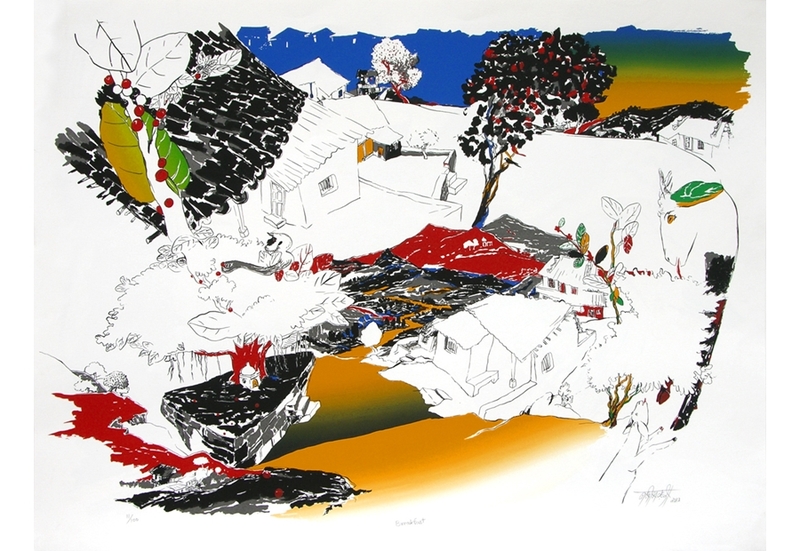 Image Size (H x W): 30" x 40"
Medium:Serigraph on Paper in 10 colours. Edition of 100. >Nabibakhsh Mansoori was born in 1966 in Idar, Gujarat. In 1990 he has completed his Diploma in Fine Arts (Drawing & Painting) from Sheth C. N. College of Fine Arts, Ahmedabad. In 1992 he has completed his Post Diploma in Fine Arts (Creative Painting), Faculty of Fine Arts from M. S. University of Baroda. He is one of the distinguished recipients of the Bendre-Husain Scholarship of Bombay Art Society. Nabibakhsh Mansoori paintings are exuberant, and at times surreal. Mansoori looks at the world through the kaleidoscope of color, skewed and layered imagery. He loves to throw the viewer off balance and make them take a second look at the work drawing them into his world. And in Mansoori's world is a vortex, which has no beginning or end; it is a seamless existence of reality and the dream world. Since 1992 Mansoori has held solo shows in Ahmedabad, Mumbai, Idar, Surat, New Delhi, among his popular shows ‘Tiger! Tiger!’ In 2010 by Archer Art Gallery, Ahmedabad, and in 2011, ‘Tiger! Tiger!’ By Kalakriti Art Gallery in Hyderabad. In 2009 ‘Moving Malls of India’ by Archer Art Gallery, Ahmedabad, In 2006 ‘Weaving Dreams’ organized by The Visual Gallery at Gallery 27, London. He has participated in many group shows in India like, Ahmedabad, Hyderabad, New Delhi, Surat, Mumbai, Bangalore, Kolkatta, in abroad like, London in 1999, 2002, 2005, in Dubai in 2003. In 2013 'Twilight' by Archer Art Gallery at Ahmedabad. His work has also featured in Sothebey’s auction held at New York in September 1998 and at London in Jun 1999. He lives and works in Gandhinagar.